Died March 6, 2017 at his New York City apartment after a long battle with kidney disease and yet on his own terms. He was born May 3, 1932 in Colfax, WA. Robert was an exceptionally devoted and dedicated son, brother, cousin, uncle and friend. He was the cherished son of Hazel Ida Jolin and Robert E. B. Osborne; brother of Joan Osborne Beck; first cousin of Susan Wright and Linda Bigham; uncle of Sandy Cramer, Cheryl Wagner and Jeni Wagner; and their families. He never missed an opportunity to bring family and friends together. Turner Classic Movies host and film historian, Robert was a beloved presence on the television screen and on the streets, where fans constantly approached him, often sheepishly, not to ask for an autograph but to thank him for keeping alive the great movies of years past. To his family and friends, he was the same witty and warm person you saw on television, a tad funnier and more irreverent perhaps, but always caring and genuinely interested in those around him. Polished and urbane, he was old Hollywood even as a boy. Inspired by silver screens in the Palouse, Everett and Seattle, he lived his dream. Memorial plans pending. Donations to the ASPCA, 424 E. 92nd St., NY, NY 10128 or The Animal Medical Center, 510 E. 62nd St., NY NY 10065." I've noticed it. It's the first time they've used it without Robert doing the intro. It's obviously in his memory. I could be wrong, but haven't they been using it for all the guest hosts? That's correct, it has been getting used for all of the guest hosts who were filling in for Osborne. Thanks so much for posting this. It's a wonderful obit. Kudos to the writer. Curious about that middle name- "Jolin"- a family name perhaps? Yes. His mother's maiden name was Jolin. My bad. I guess I haven't been watching right at the beginning of the prime time films lately. Don't know if this has been posted earlier, don't have time to go through all the pages. Here's the memorable June 3, 1977 episode of "Dinah!" -- Dinah Shore's syndicated talk show -- in which Robert Osborne tells the two-time Oscar winner Shelley Winters how she inspired his 1965 reference book "Academy Awards Illustrated." The program also features some of Osborne's favorite Oscar-winning actresses: Olivia de Havilland, Eva Marie Saint and Shirley Jones. As a result of his appearance on the show, the producers of "Dinah!" asked Osborne to become a frequent contributor. In the 2014 special "Private Screenings: Robert Osborne," he told interviewer Alec Baldwin that the "Dinah!" appearance was one of the many lucky breaks that led to his becoming the host of Turner Classic Movies in 1994. He shows up at the 35:40 mark. Please, please, TCM management, have the good taste to NOT exploit Robert Osborne's movie memorabilia collection in your next TCM/Bonham's auction. Hawking the things which he collected and treasured during his lifetime should not be a "revenue stream" for TCM, IMHO. I remember this picture from the article about his apartment in New York. 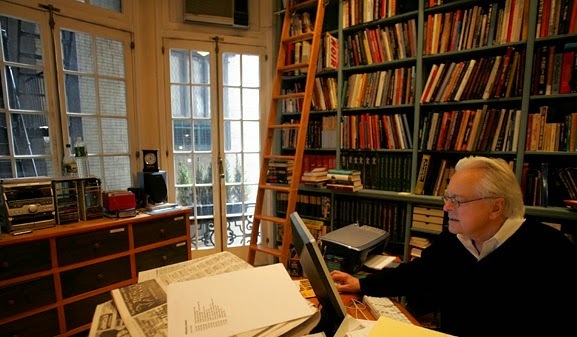 What I always wondered was how the floor held up under the weight of all of those heavy book cases, assuming he is not on ground level. 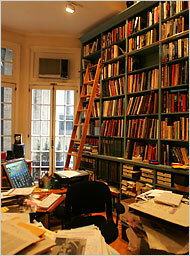 I actually knew somebody who made a library on the second floor of their home and had rows of book cases in it. The floor busted in the middle one day while the guy was at work. Seems like I remember that he had two apartments in that building and I think maybe one of them was the bottom floor. I was just listening to an interview with Robert and I knew he used to go to Atlanta for a week every month to shoot his spots. He said they would shoot 150 intros and exits during that time. That's a lot. But then he had the other 3 weeks to do his own thing. You could tell he loved his job. ps- closest bookshelf to the window, shelf below the top shelf, love how that one part of the book title NOIR just leaps out. That's too bad about Cluny Brown. They've only aired that a few times and I was looking forward to seeing it again. Ditto Bluebeard's Eighth Wife. I hope they will be rescheduled. In fact- in the DEPT. 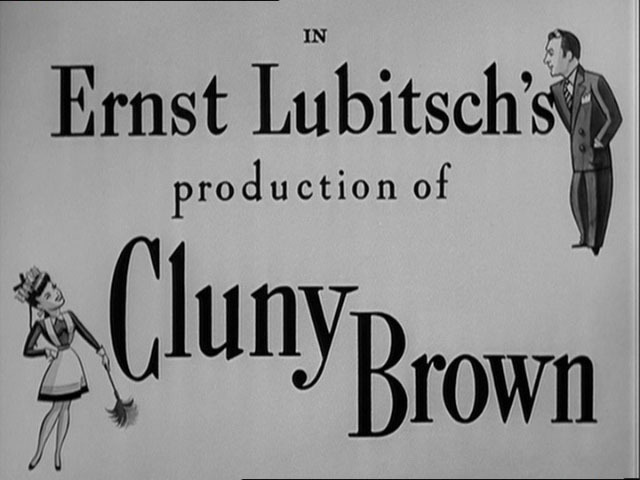 OF STRANGE COINCIDENCES- CLUNY BROWN is probably my favorite memory of a TCM Viewing experience ever. I think it was Christmas Eve 7 years (or so) ago and this was Bob's pick for the night. I do not like anything about Christmas. I was just getting ready to put the nylon over my head and go out and smash some lawn decorations when this came on; and as per Bob's spirited introduction and the fact that i found the title intriguing, I gave it a looksie. And Godspeed, Mr. Osborne, forever am I indebted to you for brightening my life that night. You are both in luck. Cluny Brown is on the schedule at Noon Eastern Time on Sunday, April 23. But thanks very much for the FYI, I enjoy a good mystery.